Concurrently with the new S1 and S1R models announced today, Panasonic will introduce three new lenses based on the L-Mount system for Lumix S Series cameras. Comprising two zooms and one prime lens, the line-up includes the Lumix S 24-105mm f/4 MACRO O.I.S. (S-R24105), which will be offered as a kit lens, the Lumix S PRO 70-200mm f/4 O.I.S. (S-R70200) and the Lumix S PRO 50mm f/1.4 (S-X50). All three new lenses are dust and splash-resistant and can withstand use in temperatures down to -10 degrees Celsius. 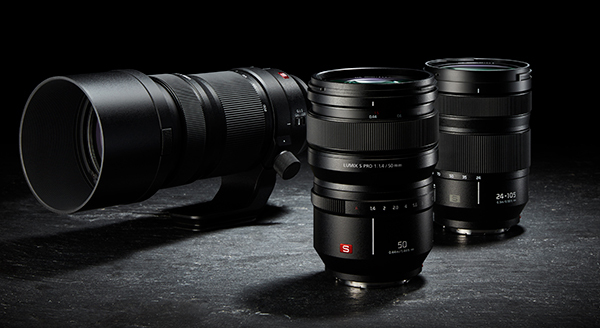 In a full-frame first, the S-R70200 and S-R24105 lenses are compatible with Lumix 5-Axis Dual I.S. stabilisation, which combines 5-axis internal stabilisation with the optical stabilisation in selected lenses to support up to 6 stops of shake correction. The new lenses are based on the Leica L-Mount, which has been adopted by the L-Mount Alliance manufacturers, Leica Camera, Panasonic and Sigma. The advantages of this mount are a large inner diameter of 51.6 mm that enables extremely fast lenses and compact dimensions. The configuration of the lens-to-camera communication interface is future-proof and the L-Mount also offers an option for the construction of sealed systems that are resistant to dust and moisture. The Lumix S 24-105mm f/4 MACRO O.I.S. is a versatile standard zoom lens that also supports 0.5x macro shooting with a minimum focusing distance of 0.3m. Its optical design consists of 16 elements in 13 groups and includes two aspherical lenses and two ED (Extra-low Dispersion) lenses for suppressing chromatic aberration and achieving high resolution. The filter diameter is 77mm, and the lens has a 9-blade circular aperture diaphragm. A high-precision linear motor achieves sensor drive at a maximum speed of 480 fps for fast autofocusing. A special mechanism suppresses focus breathing. The RRP for this lens is AU$1899. Covering the popular 70-200mm zoom range, the Lumix S PRO 70-200mm f/4 O.I.S. (S-R70200) records high-resolution, high-contrast images and supports 5-Axis Dual I.S. 2 stabilisation performance to enable handheld shooting at telephoto focal lengths. The lens design comprises 23 elements in 17 groups and includes an aspherical lens and three ED (Extra-low Dispersion) lenses for suppressing both axial chromatic aberration and chromatic aberration of magnification. The filter diameter is 77mm, with a 9-blade circular aperture diaphragm. A high-precision linear motor achieves sensor drive at a maximum speed of 480 fps for fast autofocusing, while a focus clutch mechanism enables instant AF/MF switching and accurate manual focusing. The lens also excels in video recording performance with a mechanism that suppresses . The RRP for this lens is AU$2499. The Lumix S PRO 50mm f/1.4 (S-X50) is a fast prime lens with impressive optical performance, thanks to an optical design comprising 13 elements in 11 groups. Two aspherical elements and three ED (Extra-low Dispersion) lenses effectively suppress both axial chromatic aberration and chromatic aberration of magnification, as well as correcting astigmatism. A double focus system combining a linear motor and stepping motor achieves sensor drive at up to 480 fps for fast, high-precision AF. A focus clutch mechanism enables instant AF/MF switching and accurate manual focusing. Focus breathing is suppressed. Like others in this trio, this lens accepts 77mm diameter filter s but it has an 11-blade circular iris diaphragm. The RRP for this lens is AU$3599. For more information visit the Panasonic website or phone 132 600.